See the Rubin Museum Event Details. Join us Wednesday, March 6, at the Rubin Museum in New York City for a unique Himalayan Heritage Meet-Up with Siddhartha School. Explore the power of monastic festivals in setting a communal intention in Ladakh. Listen to Ladakhis share their stories of the Guru Tsechu Festival, which takes place in Stok Village, home of Siddhartha School and Khen Rinpoche Lobzang Tsetan, the school’s founder. We’ll discuss how over 100 Buddhist families look forward to the festival as an opportunity to clear away obstacles, generate good karma, and set positive intentions for the year ahead. We will also learn about the essential power and intention of religious dance performances, known as chams, in the monastery’s festival program. 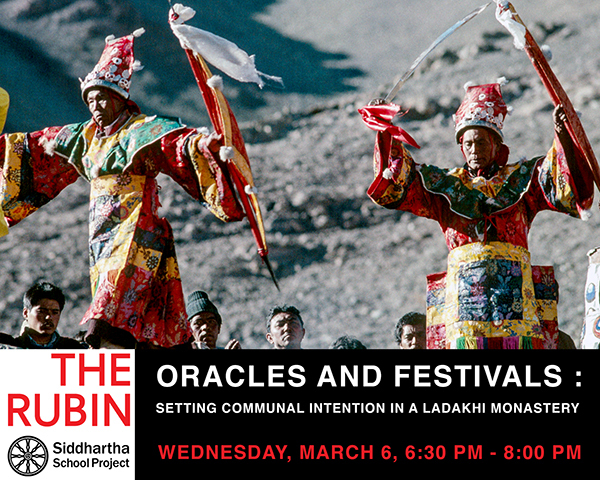 During this event, we will also discover the role Ladakh’s powerful oracles perform in making predictions, clearing away doubt, and setting intentions among the villagers and the local community.